In the collection of MyWatch beautiful necklaces and bracelets made of genuine freshwater pearls. 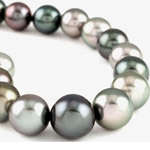 Freshwater pearls are cultured pearls that are soaked in mussels that live in lakes and rivers. 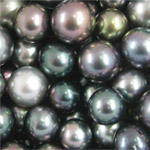 The freshwater pearls are entirely of nacre, while saltwater pearls grow from oysters, shellfish from the sea, they consist of a round bowl of chalk that is surrounded by a layer of nacre, often no thicker than a half a millimeter. The collection consists of necklaces and bracelets with a diameter of 10 mm and 12 mm.